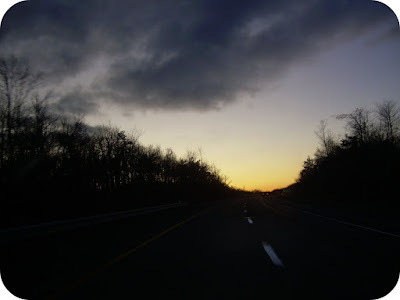 There's something peaceful about Interstate 80, as it stretches straight across New Jersey and through Pennsylvania. It runs like a needle and thread through fabric, cutting across the folds of the hills. Mountains gashed into sheer rock faces by human force to create this thoroughfare connecting the small towns and big cities. During my four years at school I made the drive in every season, but late fall is my favorite. The last leaves clinging to the trees, and muted colors below a swirling grey and blue sky. I especially love to be alone when I make this trip when daydreams turn into plans, and plans give me something to look forward to. There's no skirting around the subject; I feel completely useless. I'm working two jobs I'm not interested in, living at home, feeling restless. The long hours of solitary driving gave me a chance to sort that out and maybe what I can do to change it. lovely photos. 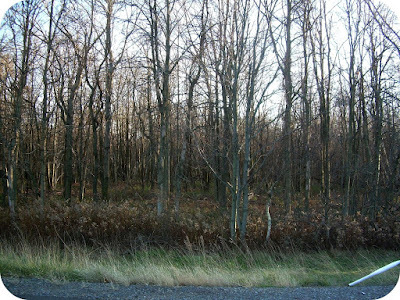 the woods are a bit creepy for me, i wonder what's in there. I've got to say i'm more of a spring person myself. the bare trees always seem mysterious and a bit creepy to me.